If you're doing it right you should be able to do it forever. That's the basic idea of sustainability. Nothing runs out, gets used up, or becomes a problem. At Raemelton it is our intention to grow plants in the most sustainable way possible. We are not content to just minimize our impact on the environment--be it soil, water or insect. We strive to take the next step of improving these important resources. 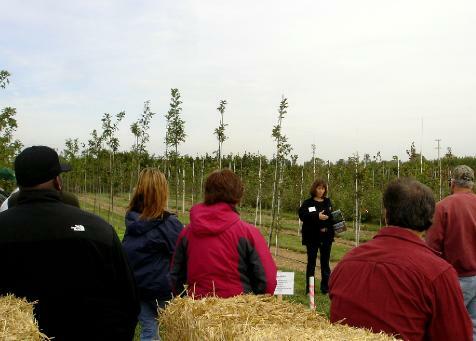 Healthier soil, cleaner water, more beneficial insects (and animals) all make for continuous improvement in tree production and plant health. And continuous improvement is about as sustainable as you can get! 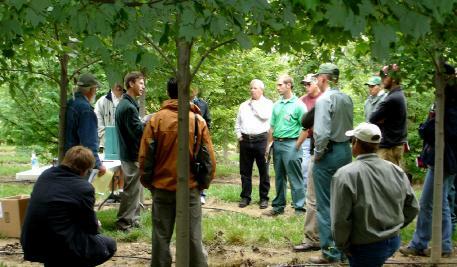 Our IPM program starts with selection of improved pest and disease resistant cultivars. There is no reason to grow--or install--pest magnets. 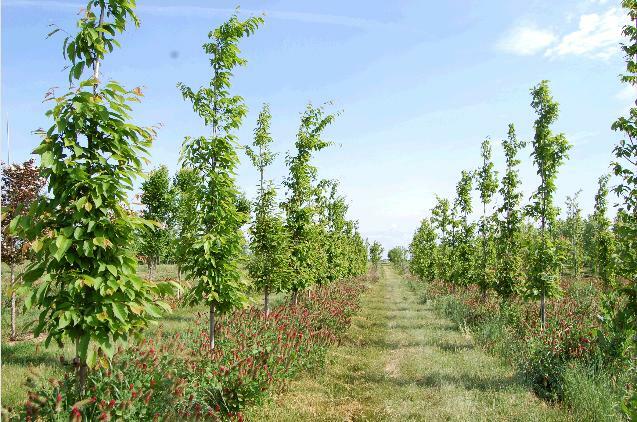 Improved selections like Appalachian Spring Dogwood, Liberty Apple, or Dura Heat River Birch require fewer inputs to grow and perform better in the landscape. We intensively scout our crops for pest or disease problems. 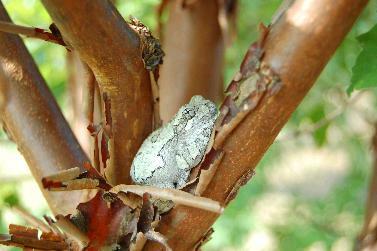 Our rigorous monitoring program allows us to detect and track pests, and evaluate our control efforts. 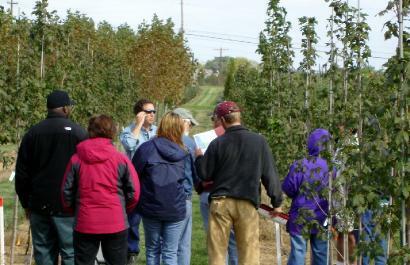 In addition, using two contracted visiting professional scouts gives us continuing 'fresh' eyes on the crops. Sure, we could do it ourselves but our scouts monitor at many other local nurseries and are able to bring information found at another location to us. Finding a few woolly aphids does not mean go fill the spray tank. 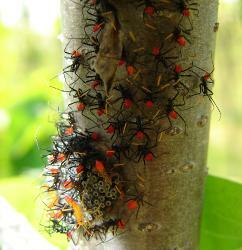 Many pests we find do not require control, at least not chemical control. By preserving and fostering beneficial insect populations we can often rely on our good bugs to take care of business. When we do need to intervene in the otherwise natural processes there is no need to use nuclear weapons. Pesticides chemistry has come a long way since DDT and Parathion. Highly targeted, reduced risk pesticides are now available. These advanced agents are designed to effect only very specific insects and have low or no toxicity to non-target insects and animals (and people). These new chemicals are not cheap and require careful attention to application details. Because we only treat with these chemicals when absolutely needed and because of our attention to monitoring insect populations, we can rely on these ‘fancy’ materials. Nothing is stagnant in the world of pests and pest control. There seems to be a constant procession of new bugs arriving each year. 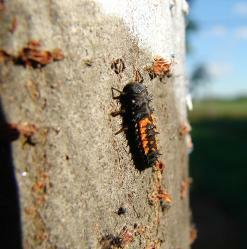 New invasive pests are a painful reality of global trade. Our native Red Maple may have learned to live with the local bugs but a new arrival from Asia can turn them into Swiss cheese (like Asian Long Horn Beetle). Our close working relationship with University of Maryland’s Extension experts keeps us fully informed of these new threats. Pest control products and techniques are also developing quickly. 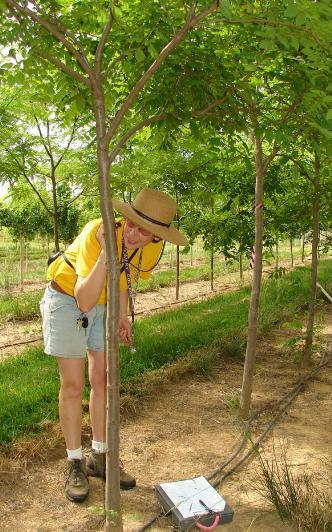 We allow researchers to conduct on-farm studies and serve as a test site for new pest and disease monitoring and control techniques. By looking into new and innovative ways to monitor and control pests we can ensure that we are always using the most refined, efficient and sustainable means to ensure clean healthy plants. By sharing what we learn with others in the green industry we can do our small part to help move the science of sustainable plant production forward. It’s the number one plant growth regulator and a critical farm resource: Water. Despite its importance no other resource is as easy to waste. From its start Raemelton has relied exclusively on drip irrigation to supply water to the production fields. 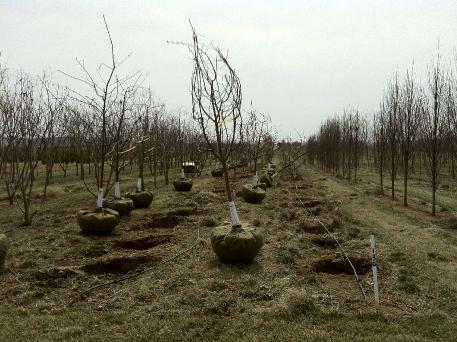 At last count we have more than 42 miles (yes MILES) of drip tube snaked down the tree rows. By using pressure compensating emitters at 24’’ spacing we can ensure that all of the supplied water goes to the trees with no run-off. Efficent and uniform water delivery is just part of our water conservation effort. Knowing when to supply water and how much is just as important. 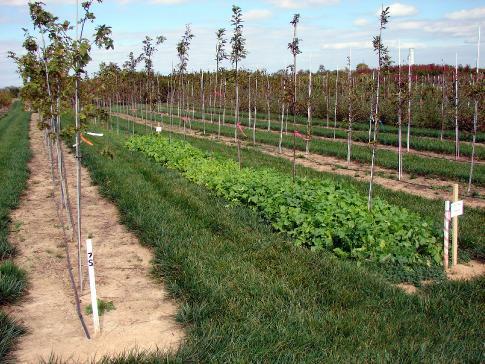 In 2008 Raemelton began teaming with scientists from University of Maryland to develop an irrigation system based on actual plant water demand (click here for more information). Those initial efforts have developed into a fantastic multi-discipline, multi-university effort (click here for more information). 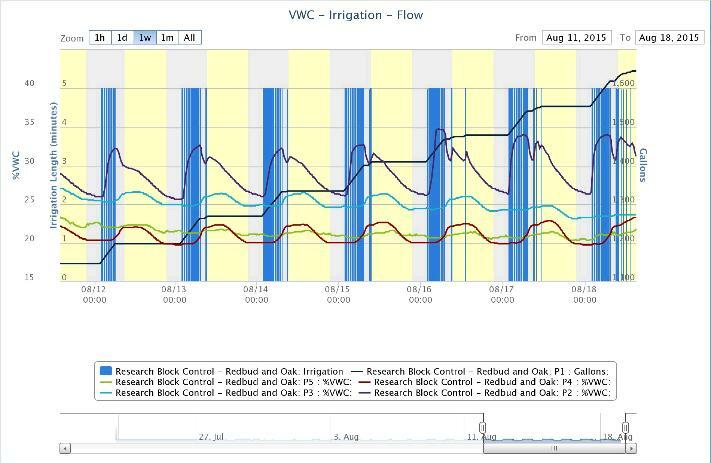 Raemelton now has two full automated irrigation blocks. Water is supplied exclusively to address plant needs. No more ‘its 9 am on Monday so turn on field 2’ style irrigation! To preserve and improve the soil at Raemelton we make vigorous use of cover crops, green manures, and compost. Our soil is terrific and we want to keep it that way. Great soil produces great plants and that is the name of the game. 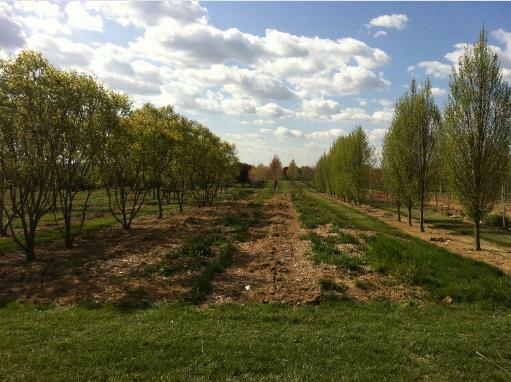 Prior to planting a new row of trees we grow a green manure crop for a year or more. 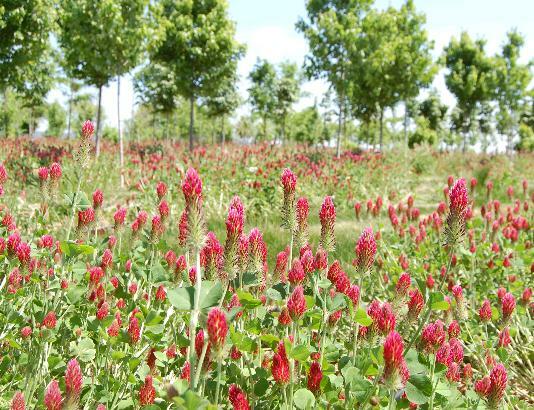 Plants like sudex, crimson clover, forage soybean, and millet provide huge bio-mass production, protect the soil, reduce erosion, and crowd out weeds. All of these winter-kill and provide a mellow soil for planting the following spring. 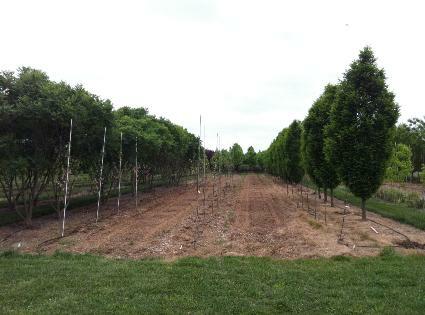 We use extensive plantings of grass sod in the tree production rows. In fact about 50% of the farm is covered by grass. 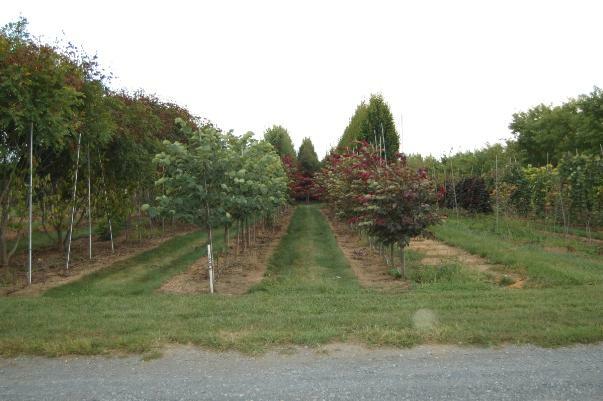 The grass aisles reduce erosion, reduce the thermal load on young trees, improve water infiltration, crowd out weeds, add organic matter to the soil, and reduce compaction. Grass buffers around and between the production fields reduce erosion and provide stable equipment travel-ways. Additional fertility and organic matter is provided by compost. 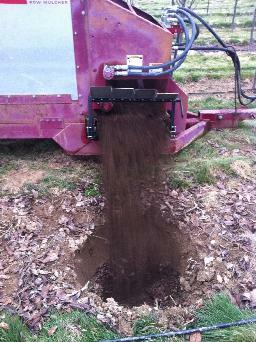 Raemelton produces its own compost in-house using locally supplied horse manure. We use the compost both as an amendment to new ground and as a top dressing for already planted rows. 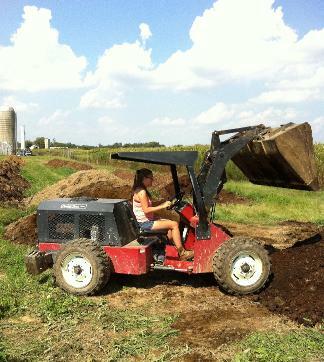 The annual volume of finished compost doesn’t seem huge, but when you work the number it turns out to be the equivalent of 150 horses living at the farm! The old grass aisle is killed and we plant directly into the residue. Once the trees are in and irrigation is put in place we attend to the new grass aisle. If planting in the fall we immediately seed the new permanent grass strip. If the rotation occurs in the spring, and there is not time for the grass to establish before summer, we seed winter wheat. Yes, ‘winter’ wheat. The wheat provides ground cover for summer and dies by late summer--without any work on our part! We can then plant grass into the wheat residue. 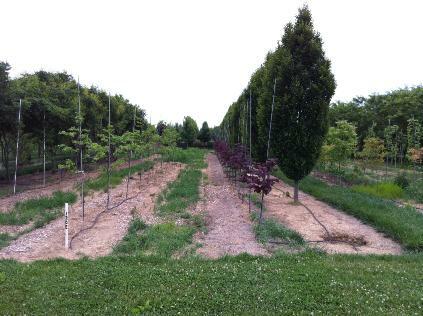 The last photo shows two new rows of Whitebuds and Forest Pansy Redbuds near the end of their second year in the ground. Grass aisles have established too.